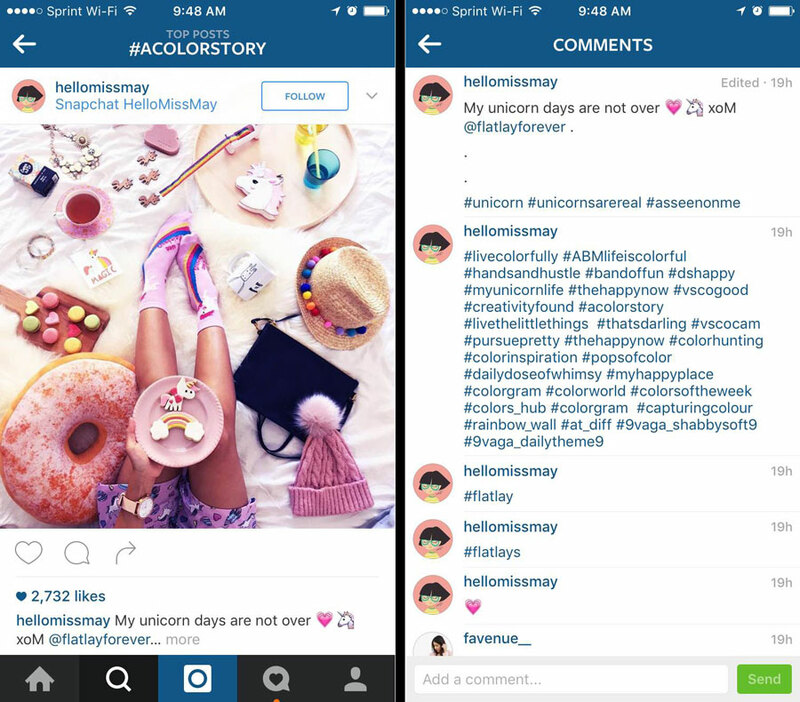 Do Instagram Hashtags Belong in the Comments or Body Text? — CROWD. Instagram’s recent spate of algorithm tweaks have been increasing competitive efforts for visibility on the platform. Insiders at Facebook have called this is an intentional adjustment to reduce spam-like and irrelevant behavior from certain Instagram accounts. However, the shift has engendered an interesting experiment for users on where to place hashtags to game the system. There’s nothing wrong with playing around with this, but it’s important to note that managing a personal Instagram account is much different from managing a brand account. The hashtag strategy that finds purchase for travel images on your personal profile won’t necessarily succeed the same way for the consultant business profile you’re working on. Some have started putting hashtags in the comments, which originated as a way to keep post captions looking neat. However, people soon discovered that these commented hashtags were also discoverable by the algorithm. Ultimately, “growth hackers” decided to adopt the tactic of swapping out and editing hashtags to surface content for more terms-- which could possibly work, but which is definitely exhausting. So where do hashtags belong? This quick experiment by Scott Ayres at Agorapulse analyzed the content performance of Instagram posts when the hashtags are placed in the caption vs. when they are placed in the comments. Ayres looked at 117 posts across 3 accounts totalling 13,700 Insta followers. He used his own personal Instagram account, Agorapulse’s, and the account for his local bounce house business. He ended up making 51 posts with the hashtags in the comments and 66 with hashtags in the post caption, and used 30 hashtags for each post. After 30 days, the numbers came in. In percentages, this means that when the hashtags were in the comments, there was a 19.37% increase in follower comments, and profile visits were up 5.88% under the same condition. However, when the hashtags were in the body text, there was a 9.84% increase in likes, and reach was 29.41% higher. With a reach increase like that, it’s apparent that putting the hashtags in the original post is more worthwhile than attempting to add them to the comments after the post is live. Even with the 19.37% increase in comments, over the data, this represents only half a comment more per post. Ultimately, it’s worth it to experiment with what works best for your Instagram account, but the data clearly indicates in favor of placing hashtags in the original post.